I wanted to shoot my shelves or something but I've been writing. 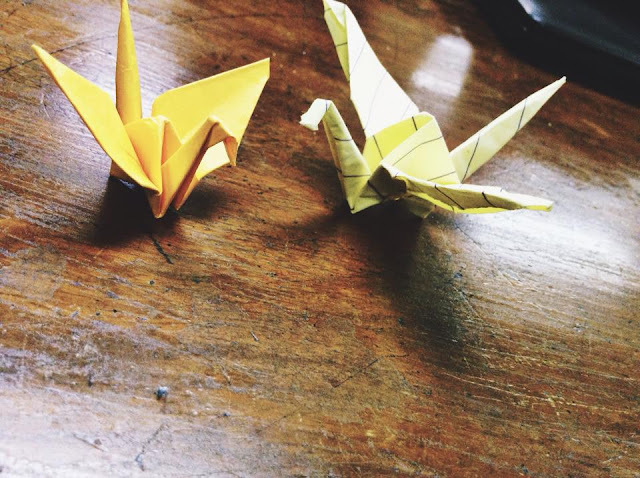 So here are little cranes from way back then. So this blog is almost 3 months! I've been sucking at keeping up with this blog lately because all I can seem to do after school is just lie down and rest, and then, proceed to do school work. But since there's going to be a week-long break before the second half of the semester, I thought I'd share a few things about my relationship with books. Here are some bookish facts about me! My all-time favorite book is The Book Thief by Markus Zusak. Dystopian is my least favorite sub-genre (is it called that?) in the young-adult genre. I actually own more books than clothes. I have too much books that almost every nook and cranny of our house serves as a mini bookshelf. My first Paulo Coelho book was The Alchemist and I read it when I was 13. I didn't appreciate it then but I want to try and read it again now that I'm 18 just to see if I will change my mind about it now that I can understand much more from that kind of genre. In the Shadowhunters series, I read The Infernal Devices first before The Mortal Instrument. That's why I love TID more than TMI. So far, my favorite young adult book that is not magical is Fangirl. My standard reading time for a 300-400 page book is 4-7 days. When I'm in the middle of reading a book and I need to go out of the house, I will still carry that book with me no matter how big it is just to comfort myself with the idea that I will be able to read that book even if I know that I wouldn't be able to do that. I still judge some books based on covers. My first non-children's lit picturebook was a Nancy Drew notebook about Secret Santa. If I get bored looking at clothes in the mall, I just go to the book store and spend about 30-45 minutes staring at books and reading their synopses at the back. Something I've been doing since I was thirteen--during Christmas, at secret santas in classes or in my group of friends, I always ask for either specific books, or book store gift certificates because I feel that the only reasonable thing to ask from someone else are book-related things. The book I got to finish fastest was Thirteen Reasons Why-- I finished that overnight because I was so freaked out and intrigued at the same time. Lastly, I might have fallen in love and I might've had my heart shattered and broken by books already, but I have never cried because of a scene in a book.